THE LEFT SNEAKERS ARE THE AUTHENTIC ONE. Hello my dear friends. 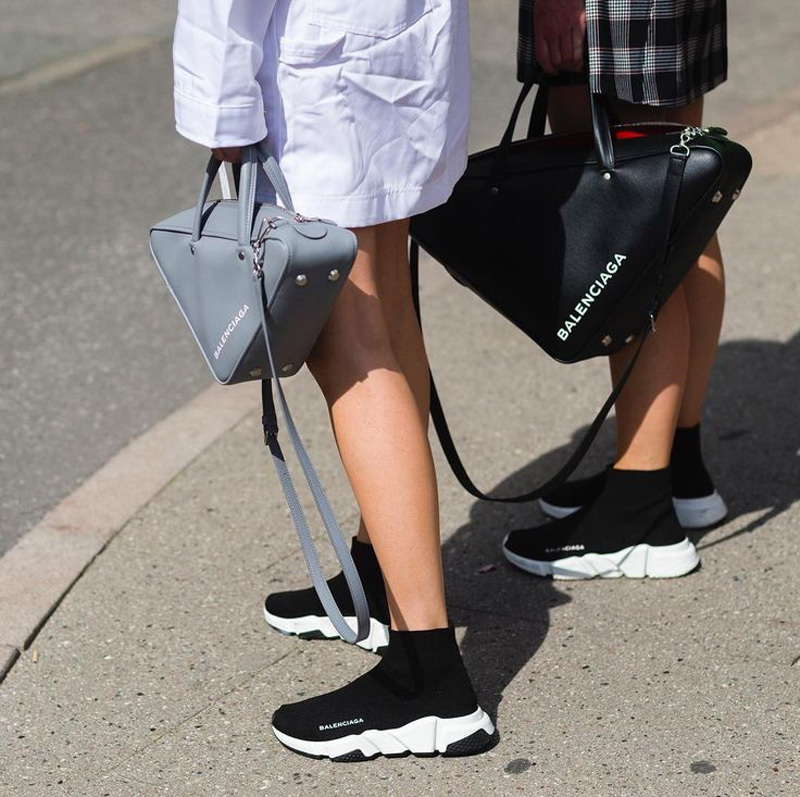 Today I am writing an article about the most sold Balenciaga sneakers, the Speed Trainers. 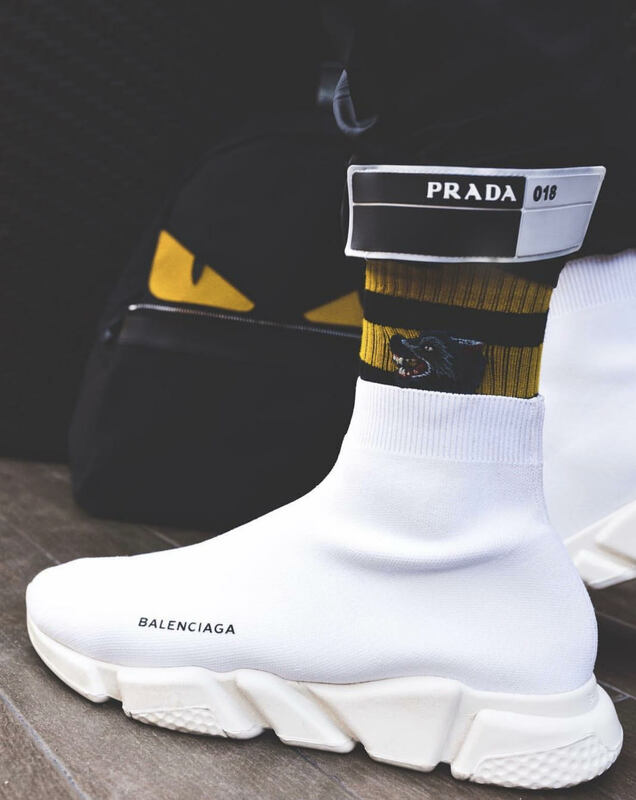 Personally, I love this type of sneakers and as you know the more this product is sold throughout the stores, it has more possibilities to be copied. 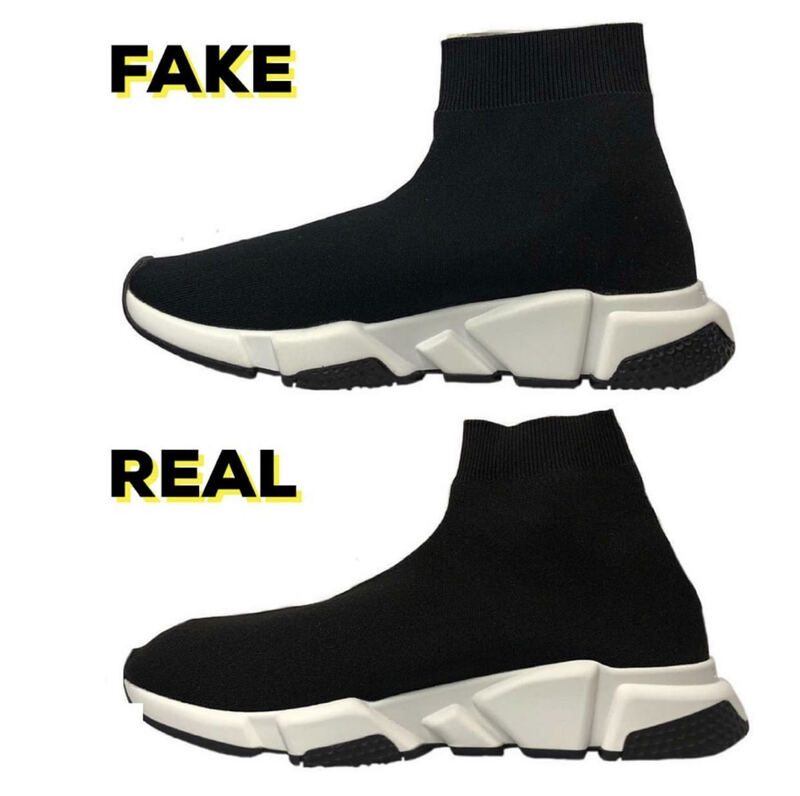 In order to make you sure when you buy these kind of shoes if you are buying Authentic Balenciaga Speed Trainers, here are some important differences you need to know between the replica and the authentic product, so no one can fool you. 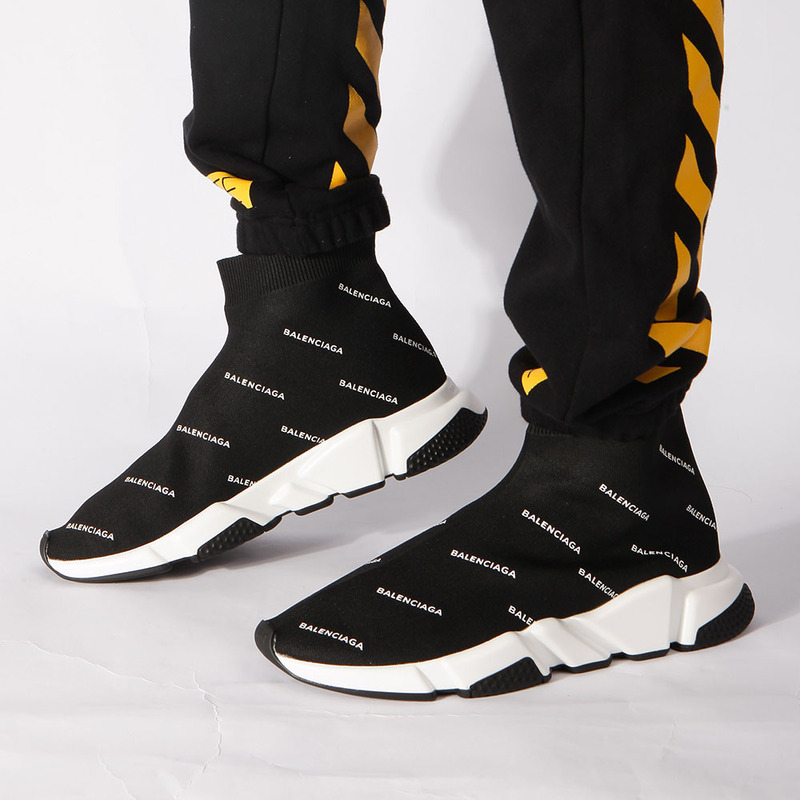 The print in Balenciaga’s speed trainers sneakers is not always the same, because the brand changes the font once in a while. The space between the letters, the way how the font is engraved, the sharpness and the definition of the print, are the characteristics you need to check before buying a pair of these sneakers. 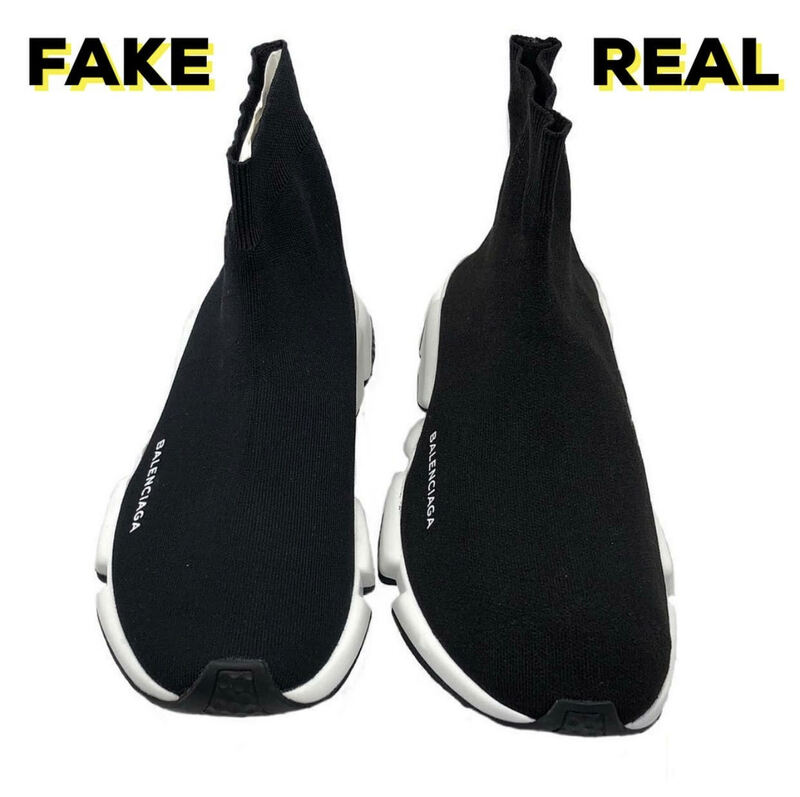 Take a look at the pictures below and once you look at the authentic pair it will be easy for you to spot the fake. But let’s see the other differences between the fake and the real in case you have any doubt. 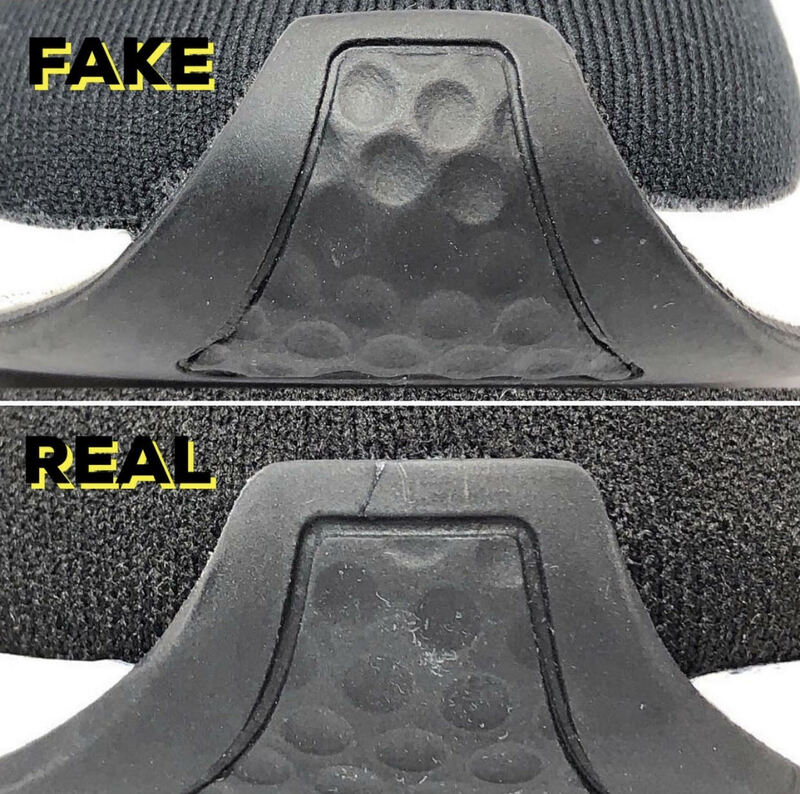 It is important to look the front shape, back and the sides of these trainers because this is the place where you can easily spot the authenticity of the product. 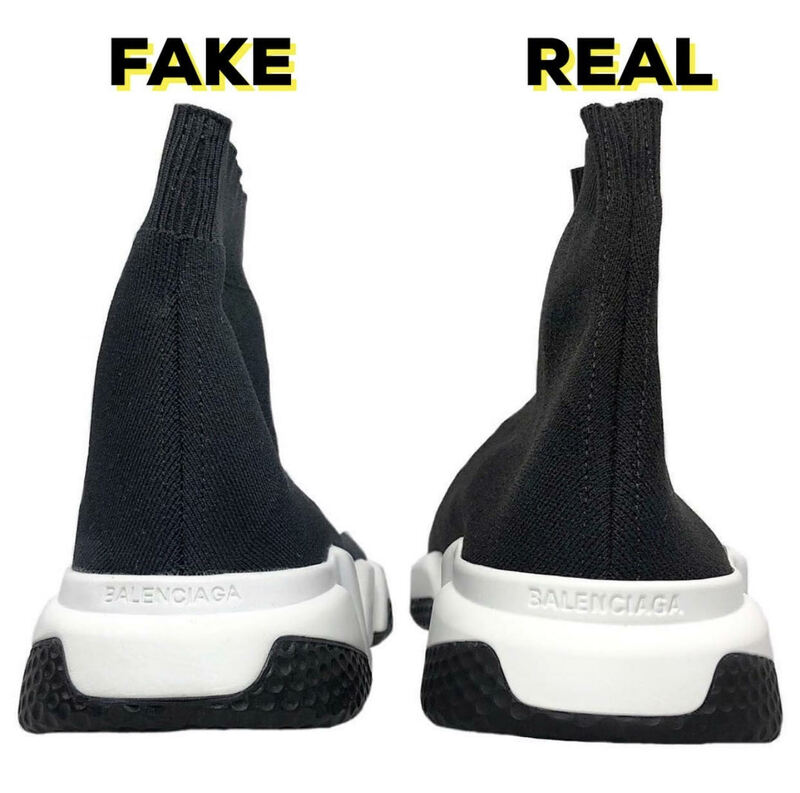 Sometimes the fake trainers are a little bit curvy in the front, meanwhile the real ones are straighter. 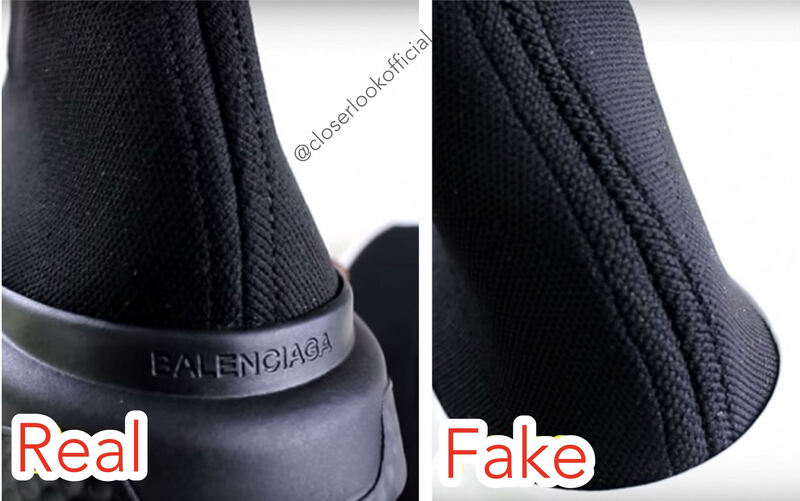 In the back of the trainers the stitching of the authentic is very regular and the line between the stitching is centered in the middle, whereas in the replica it’s very irregular and you can easily understand that you are facing a fake product. 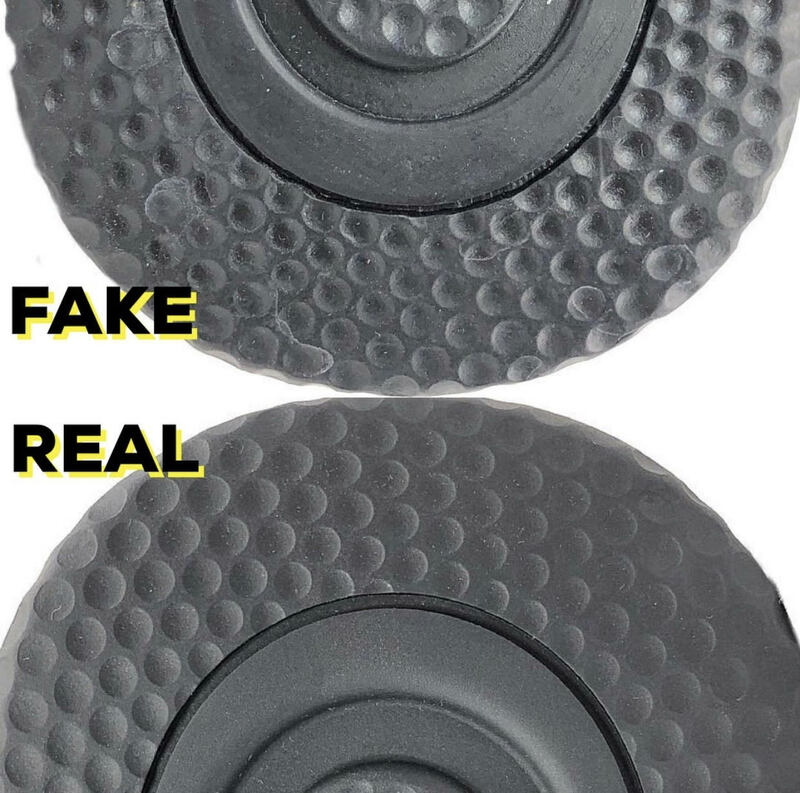 The pictures below will help you so much to spot the fake, but we will continue giving other advices to help you. A very other component of this product is the sole. 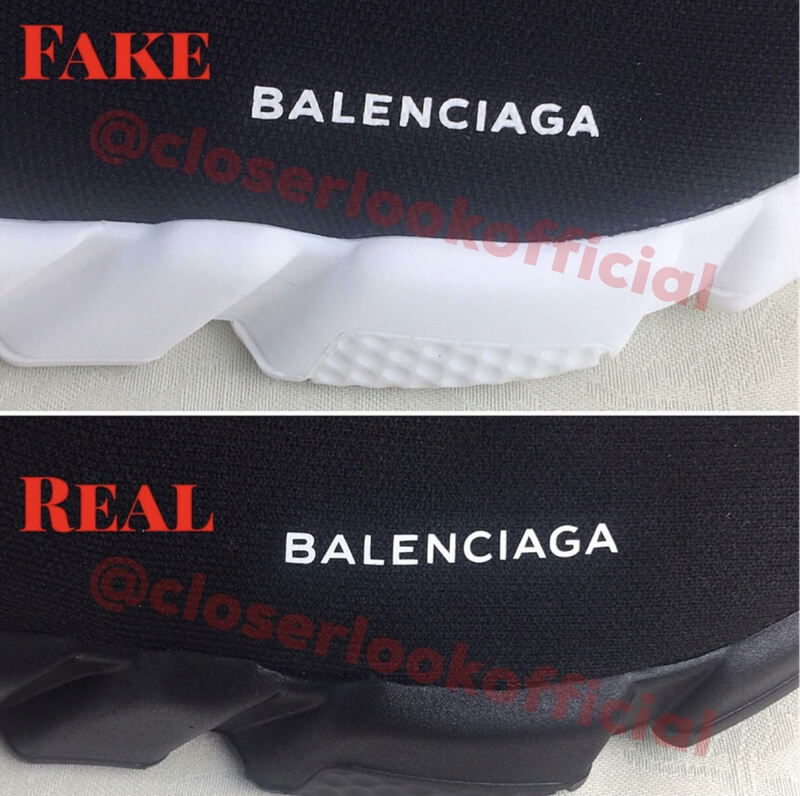 You have to look at bottom of the sole where is the “Balenciaga” writing in the middle of the sole. Other important part of the sole is the front and the back part of it. 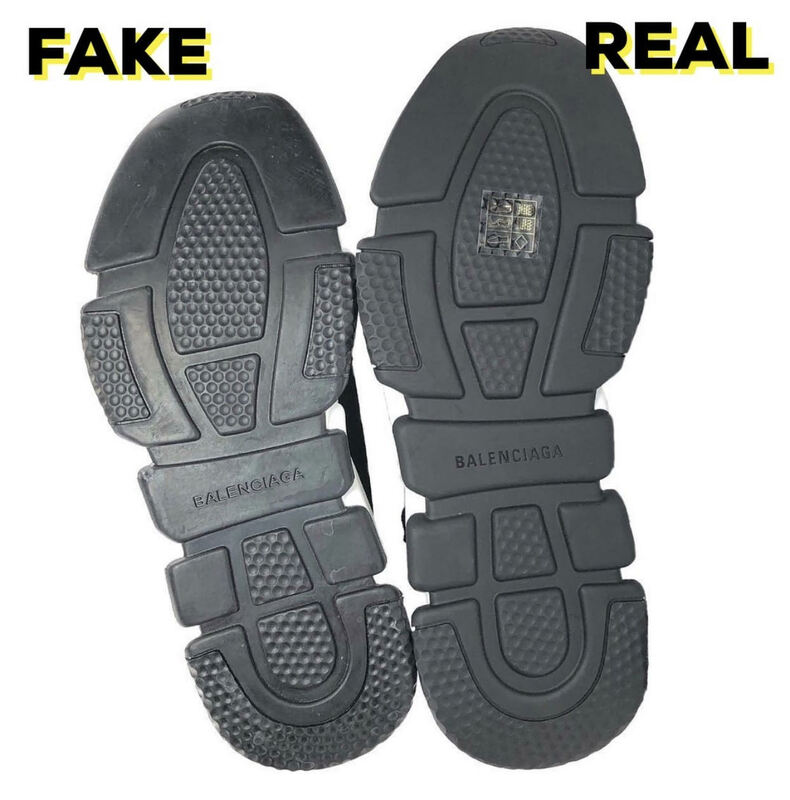 In the rubber sole of the authentic shoe, the circles are very regular and less deep than the fake one. 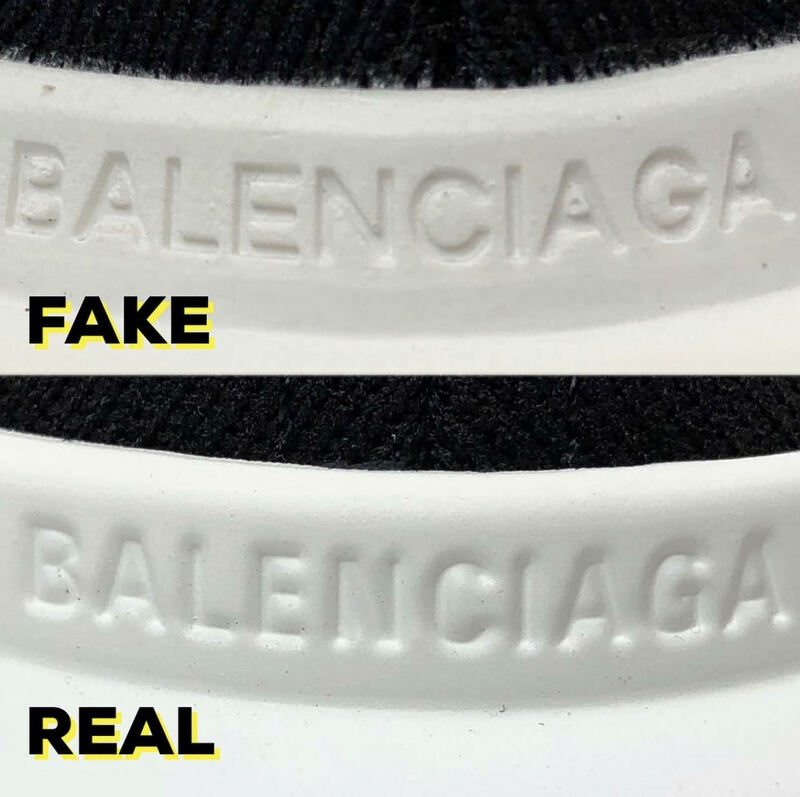 Pay attention to the photos I’m posting, because they useful more than words I mention in this article, because once you see it you understand very well the differences between real and fake. As in a lot of products we wrote about the most important thing you need to focus, which is the font, the size of the font, the material and the engraving, the color and the quality of how everything in a product is made of. 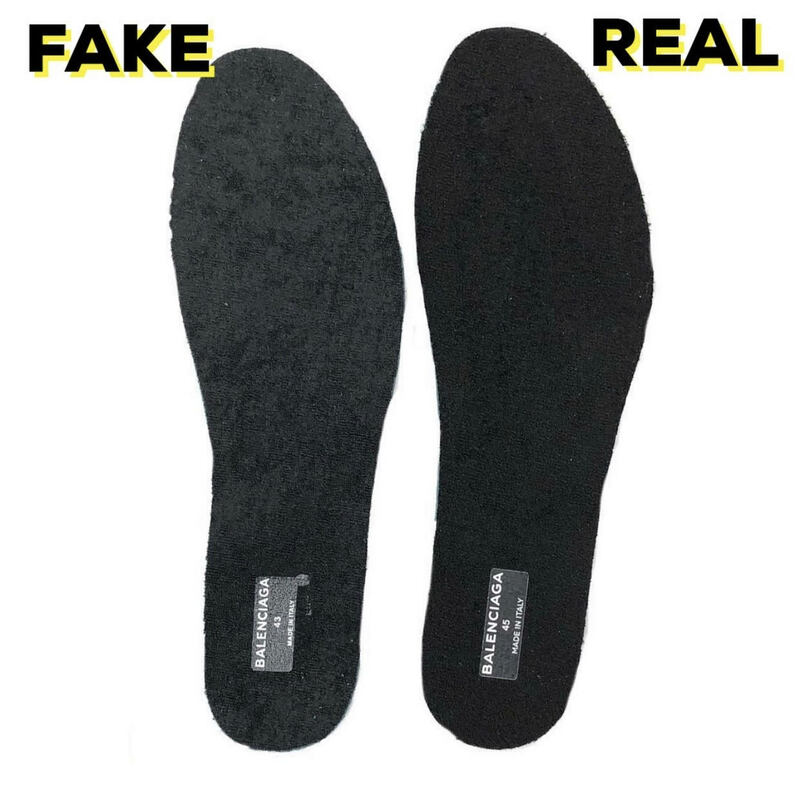 The writing inside the insole in the authentic is very different and clear compared to the fake one, the shape, the color and the material of the insole are other differences you need to spot the fake. For a better idea you can look at the pictures below. 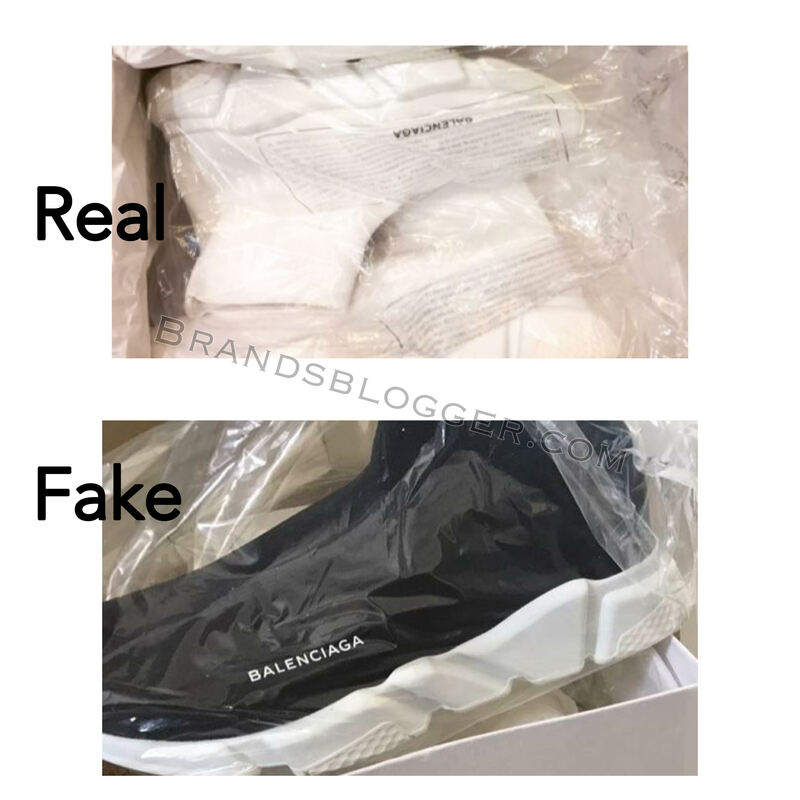 The box of Balenciaga speed trainers is usually made of a very good quality, it is not dirty or creased like in the fake one. 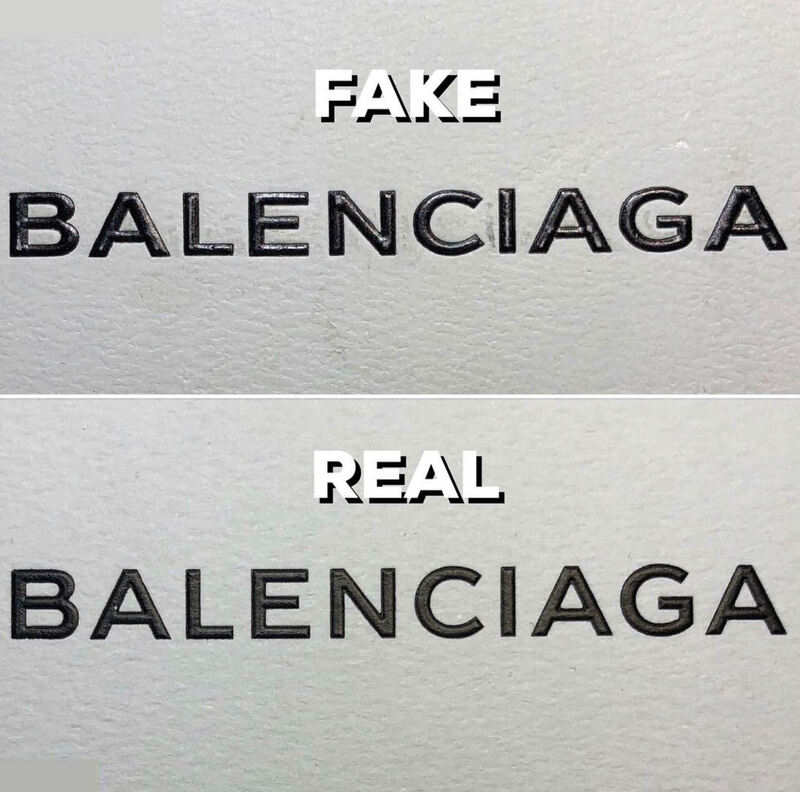 The Balenicaga logo on the box is very clear and crisp, the font is very regular and if you get familiar with the authentic you will spot the fake easily, because in the replica the writing may be too shiny and the letters are not at the same size or shape or distance between each other. 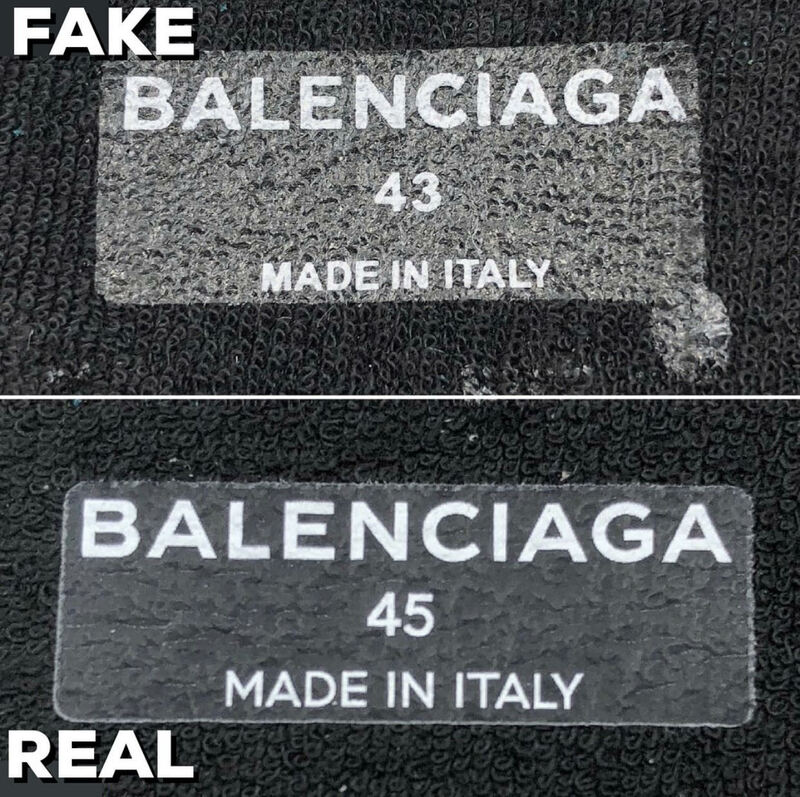 There are different types of fake so sometimes might be very similar to the authentic but the material would say it all. 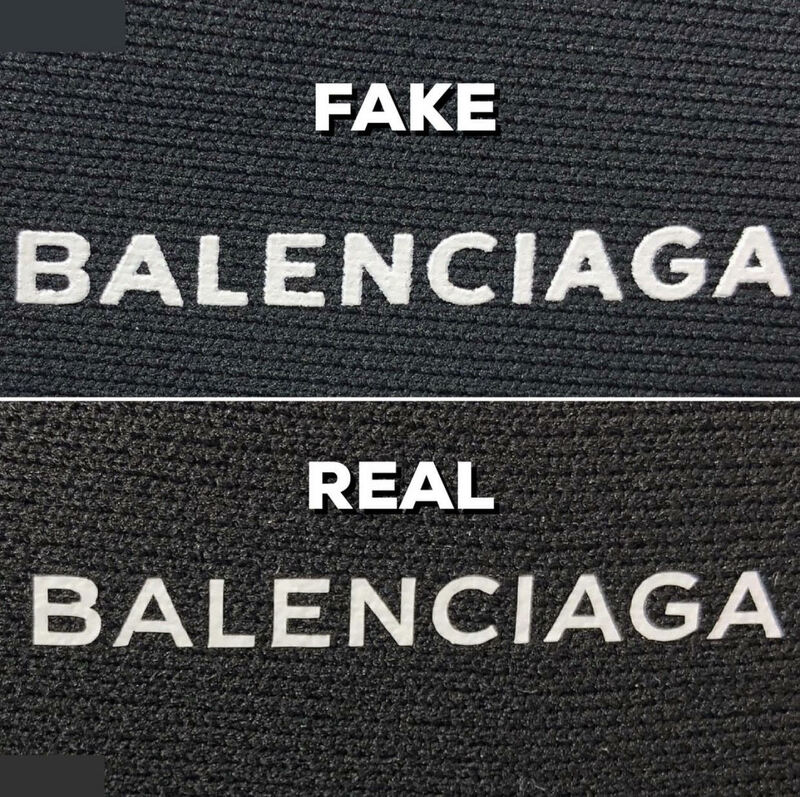 Even the dust bags are important, the material, the Balenciaga printed logo and the color are things you need to pay attention to understand with what product you are facing. You have also a plastic bag when you get your trainers in which is printed a rectangle with some things written on it, a text, meanwhile the fake ones comes with a simple plastic bag without any printing, but this can change with time. Take a look at the pictures below. 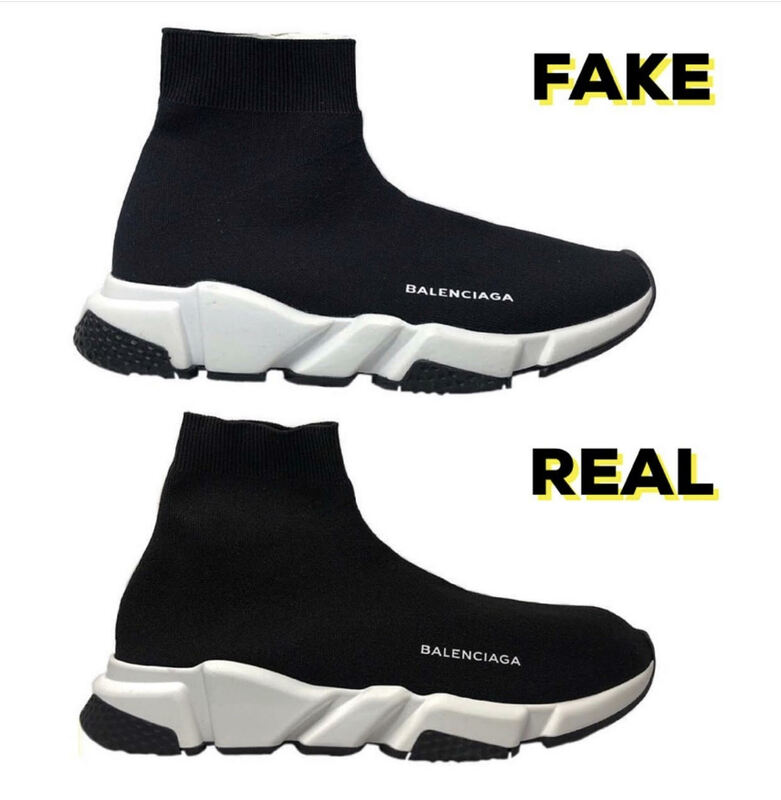 When you order your Balenciaga speed trainers you will also get a receipt and by the quality of what you will get you can tell if is fake or real. All luxury brands usually, take pride for their product so they choose the best quality to represent them in every detail. Take a look at the pictures below and be careful when you get your receipt, look at the shape, material and logo print. Thank you so much for reading this article. I hope it would be helpful to you. Please make sure to share and subscribe to help us as well. Feel free to ask and comment below your opinion which is very important to us. 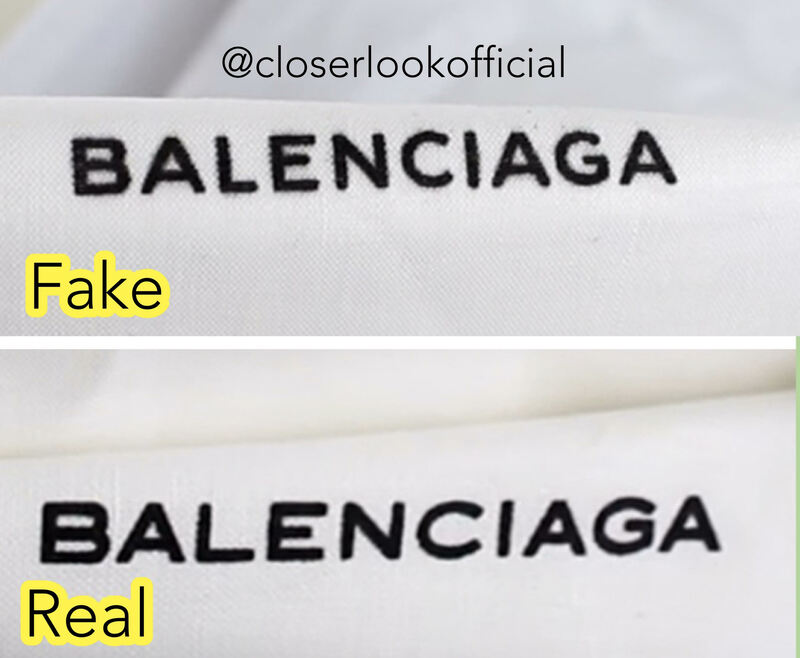 Thank you @closerlookofficial for most of the photos of the real and fake product.